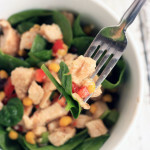 Quick and easy Southwest Chicken Salad that is packed with flavor the whole family is going to love! Somedays time gets away from me and before I know it, it is dinner time. So I am desperately trying to figure out a balanced meal that I can toss together quickly. I usually have Tyson® Grilled & Ready® Chicken on hand because the chicken is simple to make and full of protein. I also use Wish-Bone® Italian Dressing due to the robust and zesty flavor. Both of these items help make a flavorful quick meal and I can easily pick them up at my local Walmart. That is why I chose to use them in my southwest chicken salad. Once I had the chicken and dressing, then it is just a matter of grabbing a couple other ingredients to toss in the salad and we had a delicious meal. 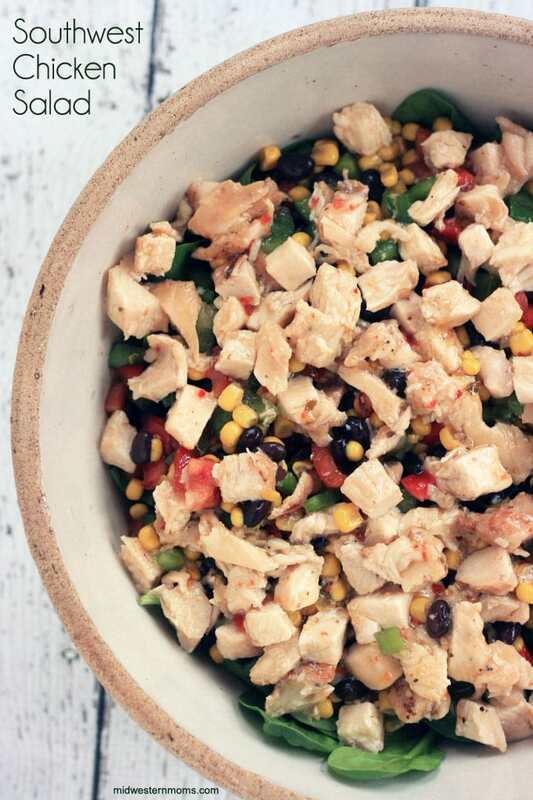 When I first tried this Southwest Chicken Salad, I was unsure if the boys would eat it. They can be picky when it comes to food. I am happy to report that it passed the picky eaters test! Prepare the Tyson® Grilled & Ready® Chicken as directed on the package.Chop the chicken into bite size pieces. 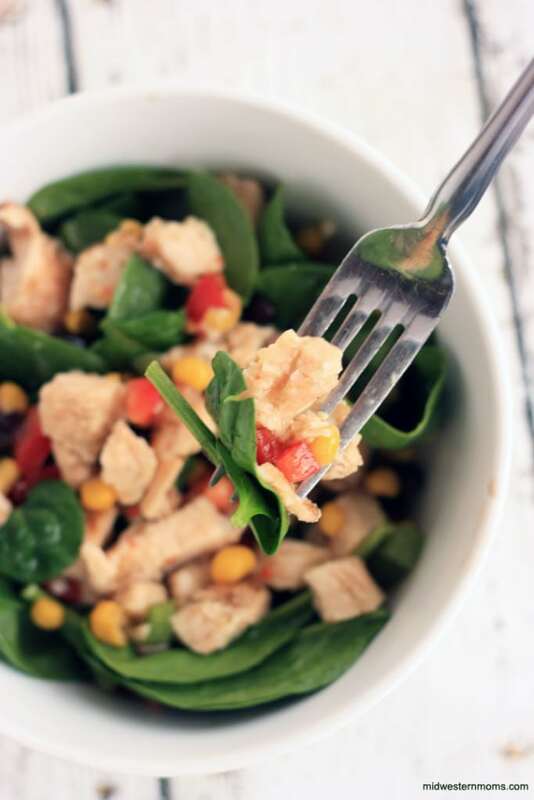 In a medium bowl, mix together chicken 1/4 cup of Wish-Bone® Italian Dressing, and lime juice. In a large bowl, place your baby spinach. 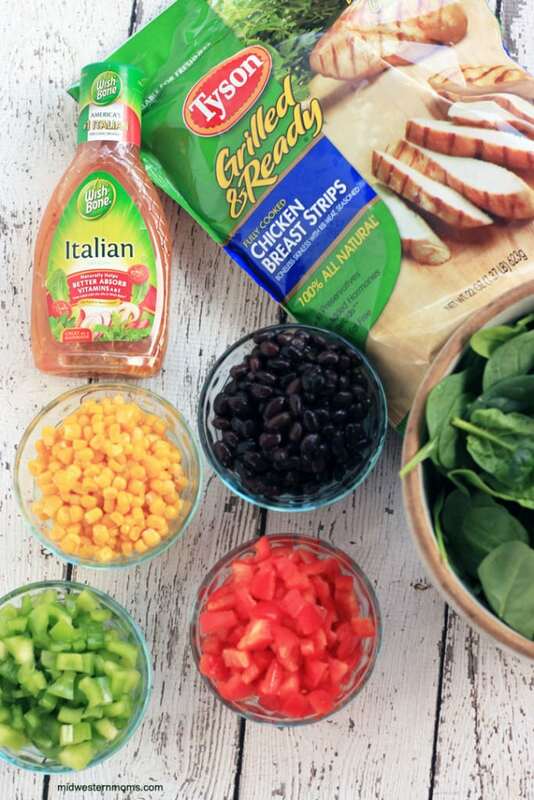 Layer the corn, black beans, and the red and green peppers, and chicken on top of the spinach. Top with the remaining Italian Dressing and serve. If you liked this recipe, check out these other ONE BOWL SALAD RECIPES.